Discover the power of Clay! 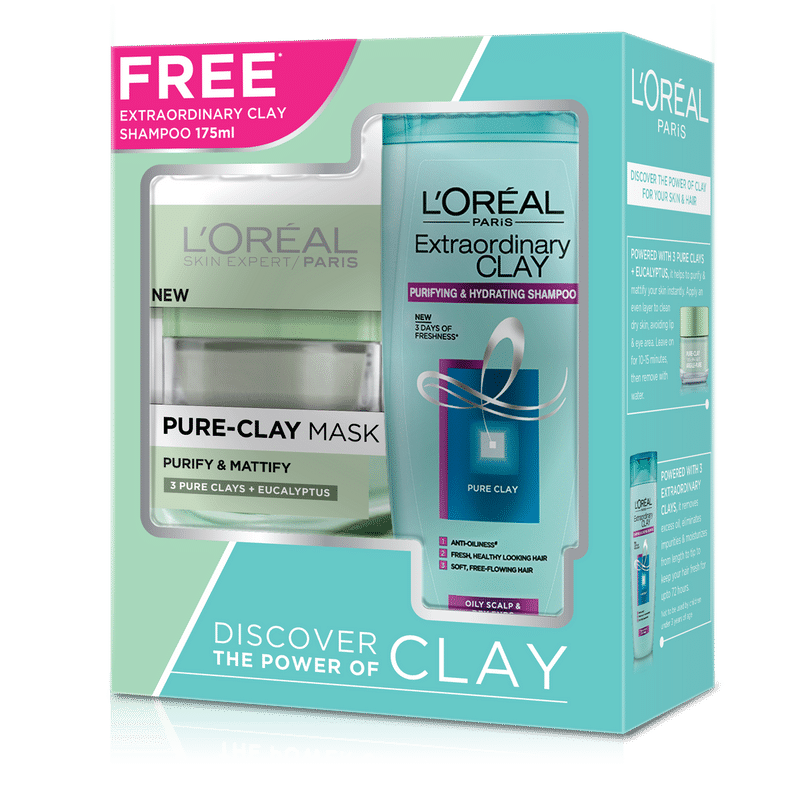 New Extraordinary Clay Shampoo 175 ml free with the Pure Clay Mask from L'Oreal Paris. 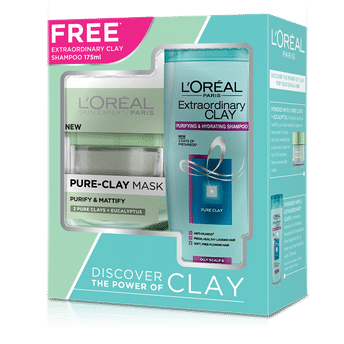 L'oreal paris skin experts have created a super charged pure clay face mask for clogged pores with the power of eucalyptus to purify and mattify your skin in just 10 minutes! Purify and mattify pure clay mask addresses your shiny and oily skin to reveal clarified, mattified and refreshed complexion. Immediately skin appears purified and healthier. Skin looks less shiny and excess oil is reduced. Pores seem tightened and less visible, without over-drying. Ideal for oily and shiny skin. Purifies and mattifies your skin in just 10 minutes. Penetrates deep to remove impurities and unclog pores. Clarifies your skin and refreshes complexion. Complete your Clay regime with the new L'Oreal Paris Extraordinary Clay Shampoo. For the first time, L'Oreal Paris Laboratories have combined 3 refined clays to create its first re-balancing range revealing perfectly balanced hair.Enriched with extraordinary power of clay that deeply purifies and hydrates your hair. The Extraordinary Clay Shampoo washes off excess oil and pollution particles, making scalp feel deeply purified for 72 hours. Ideal shampoo for oily roots and dry ends. Up to 48 hr Purified roots and hydrated ends. Helps eliminate impurities & pollution particles. Leaves hair fresh from root to tip.